Did you know there are several methods of hidden deck fastening systems fresh on the market? Richard van den Broek of Outside Concepts Sydney West puts them through their paces. Richard says ‘The three big players in this new niche market are Kleva Clip, Deck Max and Camo. All three systems are slightly different but all rely on proprietary products making them more expensive than screwing down the deck from above. All three methods involve fixing the board from the edge or side, rather than surface fixing. It means your deck remains free of holes, protrusions and those nuisance lifting boards. Hidden fastenings ensure the deck can be easily sanded and refinished in the future’. Kleva clip uses a galvanised metal fixing plate screwed to the joist. On top of that 5 boards are fixed to the plate and secured by hammering closed the teeth or claws at the side of each. 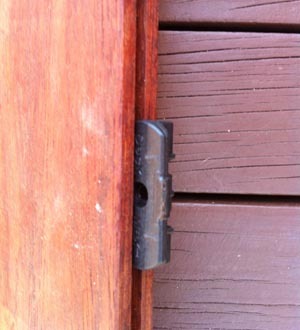 Kleva Clip comes in 2 sizes for 90mm Merbau or a range of composite decking boards. ‘This is a good system, however it could be difficult trying to replace one board for some reason – you won’t be able to get it out and likely will have to lift the entire set of five’ said Richard. Camo is a system which uses a proprietary tool and custom screw. The tool is used to to insert the screw at an angle in the side of the board. It caters for a board 80 -140mm wide using the adjustable tool and is suitable for a range of decking timbers. ‘This is probably the most flexible of the three systems I have looked at, however Camo is limited to the board sizes you can use’ he said. So if your are looking to reduce maintenance time and want a deck with immaculate finish then one of these systems might work for you. Call and talk to us at Outside Concepts, the outdoor living specialists, we keep abreast of the trends and can inform you of all the ins-and-outs of outdoor construction and the best way to get your desired result within budget.